Decks offer a multitude of benefits for homeowners like you living in the Troy, Illinois area. They provide a comfortable outdoor living space where you can cook a meal on the grill and entertain family, friends, and guests alike. They can also be the perfect outside retreat where you can relax and enjoy the rays of the sun after a long week of work. No matter how you plan to utilize your deck, Chesley Fence & Deck is the deck builder to call to create the deck of your dreams. 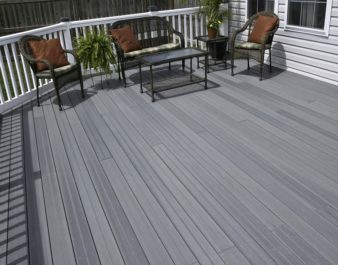 Moreover, as a premier deck builder, we offer premium warranty coverage on many of our decking products and workmanship. For instance, our Tamko EverGrain® Envision® PVC coated composite decking is backed by a 20-year manufacturer warranty that covers deterioration, fading, and staining. And, we extend a three-year labor warranty on our craftsmanship for your peace of mind. If you would like to learn more about why Chesley Fence & Deck should be your deck builder of choice in the Troy, IL area, then contact us today. We are ready to start your decking project.